Notes about CSF 2019 are here. CSF 2019 was the 7th edition of the Festival. Documentation of CSF editions 1 to 6 is here. "Grandmother Stories (Folktales) about Strong and Clever Girls and Women". The CSF 2019 Poster is here, and the schedule of the 22 events of CSF 2019 is below. Thurs 31st Jan, at 5:30pm. Location: British Council, 737 Anna Salai. Fri 1st Feb, at 9:30am. Interactive Talks by Ms Ruth Stotter and Ms Marion Kenny. Location: World Storytelling Institute, Alwarpet. by Ms Diana Tso (of Toronto Canada). "Stories about Stories and Storytelling" (45 minutes), by Ms Ruth Stotter (of California, USA). "Chinese-Canadian Monkey Queen meets Indian Monkey King" (60 minutes), by Ms Diana Tso and Ms Rubena Sinha, who often perform together. Location: LS Hall, Loyola College, Sterling Road, Nungambakkam. 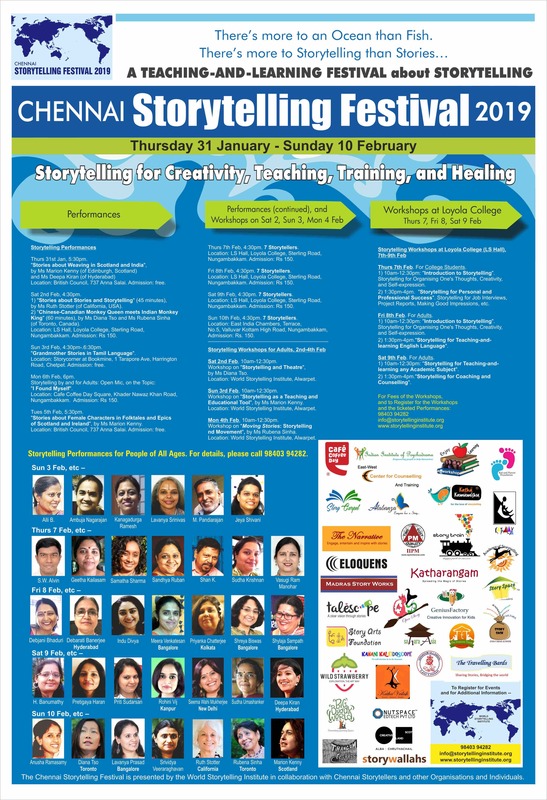 Workshop on "Storytelling as a Teaching and Educational Tool", by Ms Marion Kenny. Sun 3rd Feb, at 4:30pm. No.1 Tarapore Avenue, Harrington Road. by Ms Rubena Sinha (of Toronto Canada). Mon 4th Feb, at 6pm. "Open-mic Storytelling by and for Adults". Today's topic: "I found myself". Khader Nawaz Khan Road, Nungambakkam. Tues 5th Feb, at 5:30pm. Wed 6th Feb, at 7pm (India time). All are invited to join. Admission: Free. and might be placed on Youtube. Links to recordings of similar past videoconferences are here. A 12-page magazine section on the topic of "Storytelling and Videoconferencing," edited by Festival Director Dr Eric, is here. a 3-day Festival within a Festival. The following 6 Workshops would be conducted by teams of trainers. Click on a Workshop title to see descriptions of some of the activities that might occur in the Workshop. "Introduction to Storytelling: Storytelling for Organising One's Thoughts, Creativity, and Self-expression". Location: LS Hall, Loyola College. The only fee for the Workshops for College Students on Thurs 7th Feb would be a Rs 50 Registration fee. For this fee, students could attend one or both Workshops, and could also attend the Storytelling Performances on this day at 4:30pm. "Storytelling for Personal and Professional Success: Storytelling for Job Interviews, Project Reports, Making Good Impressions, etc." Thurs 7th Feb, at 4:30pm. Fri 8th Feb, 10am-12:30pm (India time). Rs 500, with possible discounts. For info and to Register online, please click here. via Videoconference (at no cost). Note: This videoconference would be recorded and might be placed on Youtube. Fri 8th Feb, 1:30pm-4pm (India time). "Storytelling for Teaching-and-learning English Language". Fri 8th Feb, at 4:30pm. Sat 9th Feb, 10am-12:30pm (India time). "Storytelling for Teaching-and-learning any Academic Subject". Sat 9th Feb, 1:30pm-4pm (India time). "Storytelling for Coaching and Counselling". Sat 9th Feb, at 4:30pm. "Video Recording session for Storytellers". Location: a video studio in Anna Nagar. For info: 98403 94282, eric@storytellinginstitute.org . Sun 10th Feb, at 4:30pm. Chennai Storytelling Festival 2019 was presented by the World Storytelling Institute in collaboration Chennai Storytellers, Loyola College (Chennai), and numerous other organisations and individuals.